We all use the internet just as if it were oxygen. We are able to learn and find interesting things that would have taken concentrated effort pre-internet. This newsletter is being sent over the mysterious ether. We use it to keep you informed of goings on at C2C Gallery and new items we think merit a look. Also, we offer our art for sale, online. The reason this comes to mind it that in the last month or two the internet has drifted directly into C2C space. 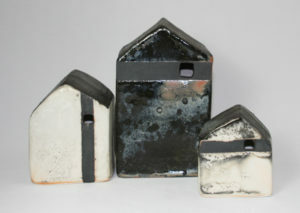 A popular blog website for ceramic art is www.veniceclayartists.com. While Cyndi was catching up on her world, one of her tour de force pieces was featured. The proprietor of this site described it as “ that inspired piece of pottery”. Completely random. It would never have seen this huge audience if not for the internet. Two years ago this vase was sold from the gallery as a Christmas gift. Another coincidence was that the Ceramic Review magazine was featuring UK potter, Rowena Brown, and her work. Some of you may be familiar with Cyndi’s houses. They are one of the most popular creations she makes. As it turns out, Rowena makes houses that seem interchangeable with Cyndi’s. The randomness of the internet !!! Cyndi didn’t know about her and we doubt that she knows about Cyndi. Creative ideas following the same path independently. 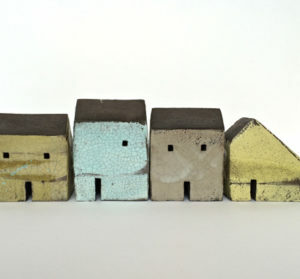 Stop in and check out Cyndi’s new work, the houses and beach series are very cool.